I visited the Kashmir Valley for the first time on a cold February day, in 2013. 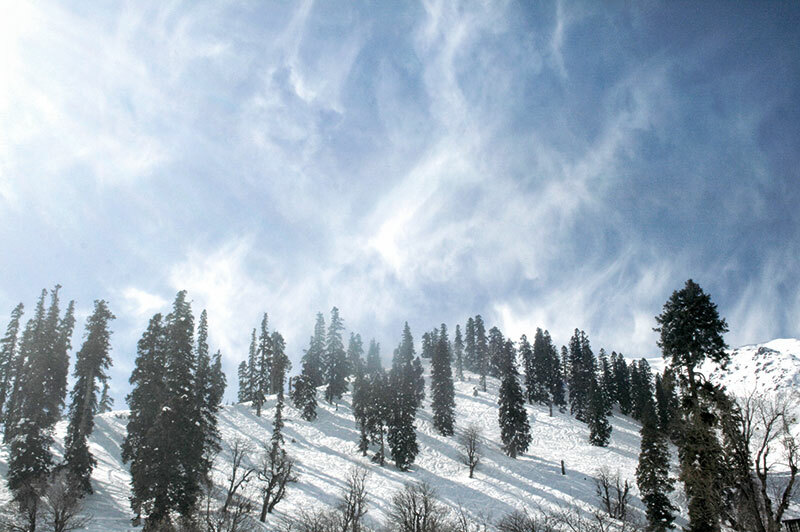 On assignment from the travel magazine where I was working at the time, my objective was fairly straightforward — get a feel of Gulmarg in all its snowy winter glory, do some skiing, experience a new luxury resort, and write about it. Politically, Kashmir was just emerging from a volatile period. In 2010, major anti-government protests had erupted in the valley, which only subsided once the state government announced measures to ease tensions. Later that year, the state decided to grant amnesty to over 1,000 young people accused of stone pelting. Although 2011 and 2012 had been mostly peaceful, there was some restiveness in the air, with the official Indian acknowledgement of over 2,000 unmarked graves near the Line of Control. These contained the remains of the many Kashmiris who had disappeared after being arrested by security agencies during the insurgency. On the other hand, tourism in Kashmir was booming. Some 1.4 million people had visited the valley in 2011-’12 — a tourism record. Bollywood was returning for film shoots. More hotels and tourism-related infrastructure was being built. 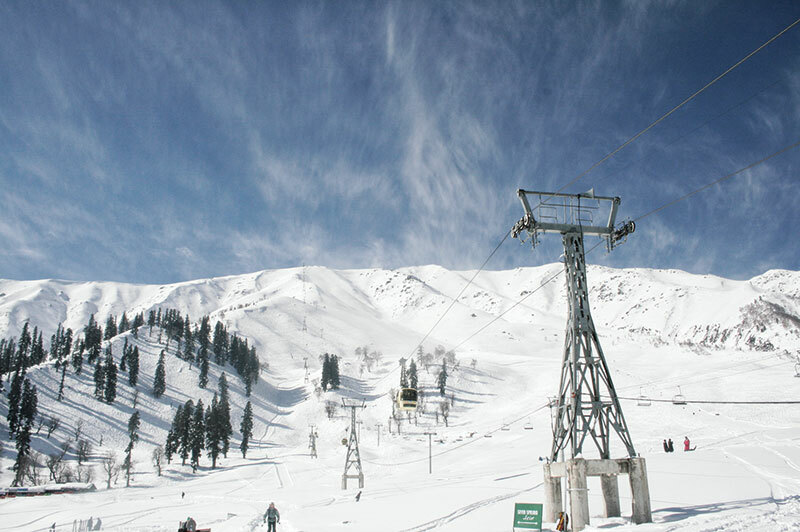 Gulmarg had been discovered by serious skiers the world over for the fine powder snow and virgin off-piste routes on the Affarwat Range. 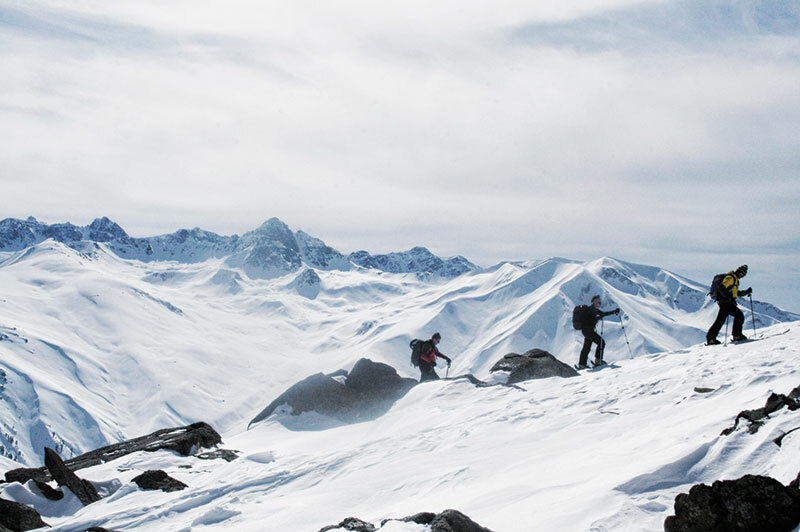 Many who’d have normally headed to the Alps, were instead making a beeline for Gulmarg. All this was in evidence when we reached a snowbound Gulmarg early on February 8. It was a gorgeous, sunny day. I still hadn’t quite gotten over the spectacular flight from Delhi to Srinagar, over an awe-inspiring vista of the Himalaya cloaked in winter white. 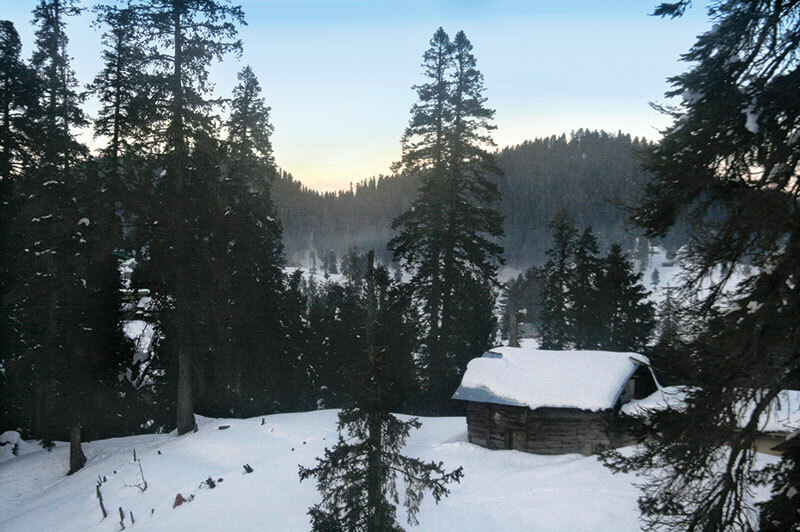 Gazing up from the bowl-shaped frozen meadow of Gulmarg, the white Affarwat range loomed like a gigantic beached whale. The gondola and ski lifts were doing brisk business ferrying Indian families and large groups of foreign skiers up the mountain, the slopes above dotted with tiny ant-like figures zipping down through the snow. We were whisked off to the hotel, and I spent much of the day staring out of the windows of my impossibly luxuriously-appointed room at the wonderland of clear skies and pine forests against the giant bulk of the Affarwat. Later, we went out to Gulmarg’s main drag, past giddily screaming families fooling around on wooden toboggans, to look for a ski instructor. We found one, the sunburnt young Anwar (name changed), who we booked for three days, along with the requisite gear. We took the gondola up to Kongdori station, along with a bunch of Indian tourists. This halfway point on Affarwat’s slopes was a carnival of people and food shacks with names such as Las Vegas Restaurant, Affarwat King and Soft Sunshine. People were engaged in snowball fights, some kids were trying to build a snowman; others were looking for instructors. Joy and wonder pervaded the air. On February 9, I woke up to the news that the Kashmiri militant Afzal Guru had been hanged in New Delhi. The main accused in the terrorist attack on the Indian Parliament in 2001, Guru had been given the death sentence by a special court in 2002, which was upheld by the Supreme Court in 2004. This was followed by a lengthy back-and-forth of clemency petitions and political slugfests. I heard that he had been executed in utmost secrecy, and that his body had been buried in the prison premises, and not handed over to his family in the town of Sopore. Overnight, everything had changed. There was a curfew all over the valley. Internet services had been blocked, TV channels blacked out, and newspaper offices raided. Starved of information, there were rumours. A militant strike was imminent, someone said. No, an Indian crackdown’s coming, someone else countered. Gulmarg is quite close to the LoC, which lies just beyond the Affarwat. Ski tour operators, so boisterous and voluble the previous day, seemed submerged in gloom. I heard more than one of them muttering, “Ab toh ho gaya, season khatam”— the season is finished! The curfew meant that operators couldn’t travel up from the neighbouring town of Tangmarg to run the gondola. However, there were a few who’d stayed back in Gulmarg the previous day, so the gondola was running to Kongdori. We made our way there to begin our lessons. Anwar, probably worried that his charges had been spooked by the news, kept reassuring us that everything was fine, and that we should just focus on learning how to ski. Shack owners, who were holding forth the previous day on the virtues of tourism, today were talking darkly about the constant humiliation of Kashmiris. We spent the day learning the ropes. For a few hours, we forgot about the larger world and focused on technique, listened to the whizz of ski blades over soft snow and tried to concentrate on not falling. Anwar was a consummate professional, guiding and coaxing us to get better. Every now and then he would meet a fellow instructor and they would exchange notes. They always looked worried. In the evening, I called a journalist friend in Delhi from the hotel. He said that protests had broken out all over the valley, and there had been clashes in Sopore, Guru’s hometown. The chief minister had asked the people to keep calm, and there was heavy security deployment all over the valley. The hotel authorities were on edge as well. This was their first season, and they feared that all their tourism dreams would go up in smoke. We were due to leave in a couple of days, and the manager said that was probably for the best, as the crisis might blow over by then. The next day, the gondola wasn’t running at all. So Anwar got us on the ski lift to Kongdori and we spent the day honing our skills, trudging up through the snow whenever the ski lift was full. Everywhere, clumps of nervous-looking foreign tourists stood around with their Kashmiri ski instructors, who were doing their utmost to reassure their charges of their safety. 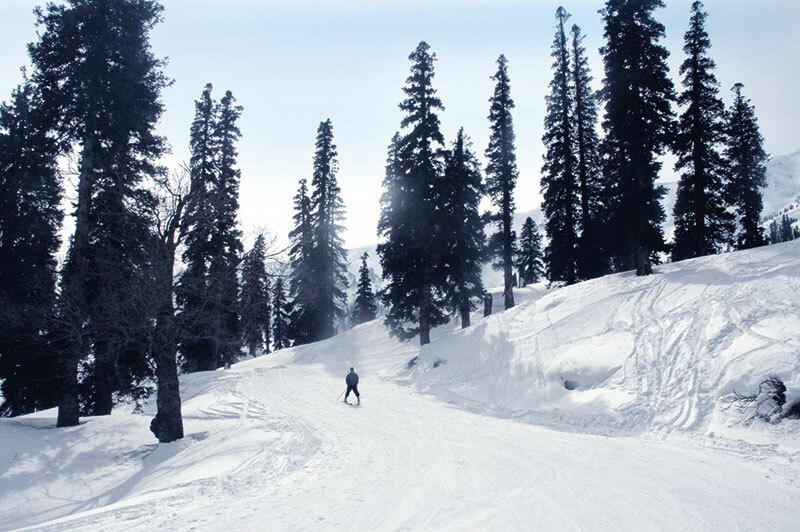 Despite the dread hanging in the air, Gulmarg still seemed like a world apart. Indian tourists, who couldn’t leave due to the curfew, were determined to have a good time. The Kashmiris were only too happy to oblige. The days continued to be picture-perfect, all blue skies, fresh snow and dramatic sunsets. A couple of days later, on February 11, the curfew was partially lifted. The gondola started running, and even the heli-ski choppers had resumed their noisy departures to the more remote parts of the range. We were due to catch our flight to Delhi on the afternoon of February 12. The hotel authorities were taking no chances. We would depart in a convoy, we were told, at the crack of dawn, for the 54-kilometre drive to Srinagar. And so we did, on a cold, grey morning. Gulmarg and Tangmarg were deserted, but as we descended into the valley, the desolation became more eerie. Every now and then, an army convoy would pass. Other than that, it was just miles and miles of bare winter trees, and the constant feeling of dread. When we entered Srinagar, past countless checkposts, the city seemed overrun with security personnel. A few locals had come out for their morning walks, but despite there being no curfew they were being turned back by the army. At the airport road, following a ridiculous charade of security checks, we had to sit outside the airport for a good six hours. Occasionally, waiting tourists would go inside to use the toilets, frisked every time. We were finally allowed in, after our baggage had been rechecked and cameras scanned for suspicious photographs. One Kashmiri man, who was boarding the same flight, saw my look of consternation and told me to stay calm. “You can’t afford to show anger when you’re in Kashmir,” he said. For his part, he cheerfully grinned and chatted with airport security, the very picture of cooperation. What were all the other tourists thinking? I wondered, as I looked at the sleepy, disgruntled faces. Just a few hours of being subjected to blanket suspicion had worn down even the jolliest Dilliwala. How would they cope if this was their life, every day? I too was a tourist, and I’d probably forget this feeling of furtive fear as soon as I’d set foot in Delhi, where my fundamental rights as a citizen were never in question. My internet would never be blacked out, nor my access to news. I wouldn’t necessarily be presumed guilty until proven innocent. I would be sharing photos on Facebook soon.